When writing shader or during any procedural creation process (texturing, modeling, shading, lighting, animating...) you often find yourself modifying signals in different ways so they behave the way you want. It is common to use smoothstep() to threshold some values and still keep a smooth transition, or to pow() a signal to modify its contrast, to use a clamp() to clip, a fmod() to repeat, an over() to combine, a mix() to blend, a noise() to enrich, an exp() to attenuate, etc etc. These are nice functions cause they are available to you by default in most systems, as hardware instructions or as function calls, so we tend to use them. However there are some operations that are often used that don't exist in any language that you still use a lot. Never found yourself subtracting to smoothstep()'s to isolate some range, ie, create a ring? Never found yourself doing some smooth clipping to avoid dividing by huge numbers? Of course. This are some of these functions that I have collected over the years. Of course you found yourself doing smoothstep(c-w,c,x)-smoothstep(c,c+w,x) very often, probably cause you were trying to isolate some features. Then this cubicPulse() is your friend. 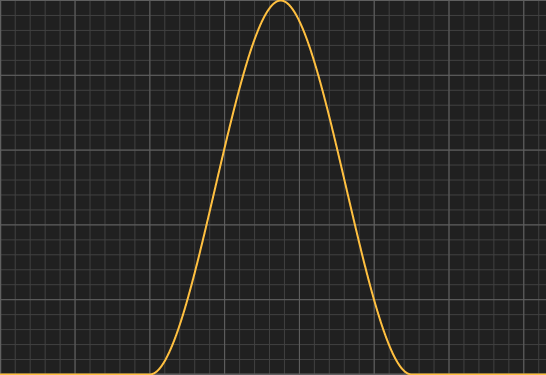 Also, why not, you can use it as a cheap replacement for a gaussian. Remapping the unit interval into the unit interval by expanding the sides and compressing the center, and keeping 1/2 mapped to 1/2, that can be done with the gain() function. This was a common function in RSL tutorials (the Renderman Shading Language). 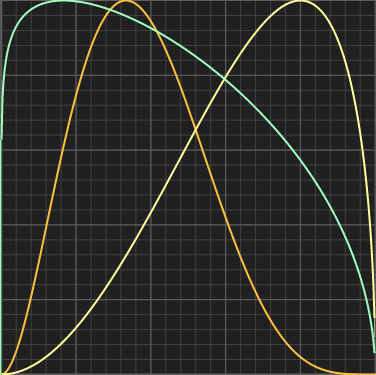 k=1 is the identity curve, k<1 produces the classic gain() shape, and k>1 produces "s" shaped curces. 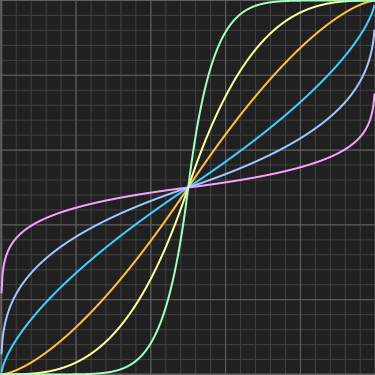 The curves are symmetric (and inverse) for k=a and k=1/a. 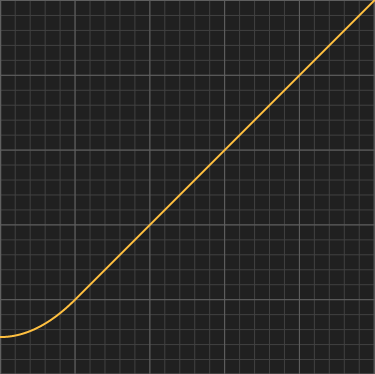 Note that k is chosen such that pcurve() reaches exactly 1 at its maximum for illustration purposes, but in many applications the curve needs to be scaled anyways so the slow computation of k can be simply avoided.